Get Your Fence Ready for Trick-or-Treaters Tonight! 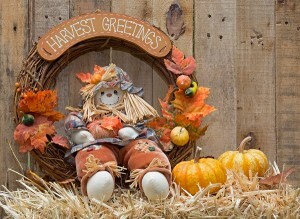 A festive display next to your fence gate can make your home look more inviting! Is your house all decked out with Halloween lights, skeletons, and jack-o-lanterns? Do you have your super scary costume ready? Are you stocked up on Halloween candy for trick-or-treaters? What’s left to do to get ready for Halloween? How about decorating your fence! Throwing a few simple decorations on your fence is a great way to make your home more inviting. Trick-or-treaters will see your fence first, which will draw them to your house for Halloween treats! Here are a few ways to get your fence ready for Halloween. Do you have an excess of plastic chains? Or perhaps some real chains laying around in the garage? Simply sling a few layers of chains over your fence posts for an easy, creepy Halloween look. If you are using real chains, however, remember to remove them before it rains! Nothing’s worse than having to clean rust stains off of your fence. If you’re going to something less scary and more magical, try some fairy lights! Simply drape lights around your fence to make your home stand out and provide a little extra light for trick-or-treaters. If you want to look super festive, look for lights that have pumpkins, moons, black cats, or witches on them! You probably have a lovely display on your porch for Halloween. Why not extend the display to your fence? At your fence gate, where trick-or-treaters will enter, place a couple hay bales, mums, pumpkins, scarecrows, and whatever else you think will make the entrance to your spooky home look more inviting to neighbors and friends in your community! This entry was posted on Monday, October 31st, 2016 at 7:35 pm. Both comments and pings are currently closed.